We can’t even stand how good this kitchen transformation is! We took down the wall that separated the breakfast nook from the rest of the kitchen. Removing the black and white tile floors and running the wood floors that are in the rest of the house created a consistent flow. With a family of 5 storage was a must have in this kitchen. We added a floor to ceiling pantry on the back wall of the kitchen to store food and appliances.. We kept the design light and airy with a touch of vintage and Mediterranean. 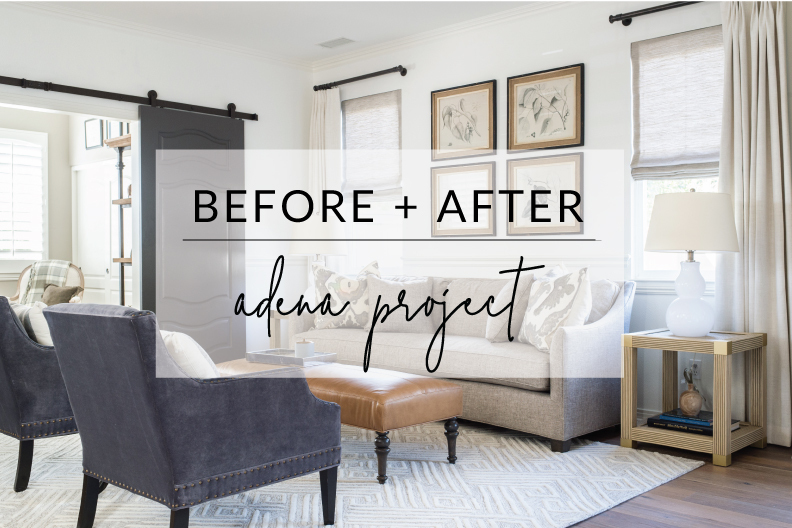 The change from before to after on this project was drastic! Even matching up the corresponding photos took us a minute and once we did we couldn’t believe what a transformation this home went through. Re-orienting the main staircase and creating another bathroom and bedroom from the extremely large master made this house more functional. Let us know what you think in the comments! This project showed us that sometimes all you need is less. When we first saw the space we realized that the furniture pieces were beautiful but not quite right for the room. Our client wanted an elegant room that served as a formal living and dining area but also have the space feel warm and inviting. We started by brightening the walls and simplifying what she already had. In the original layout the sofa was too small, the side table too large, and the rug too tiny for the space. 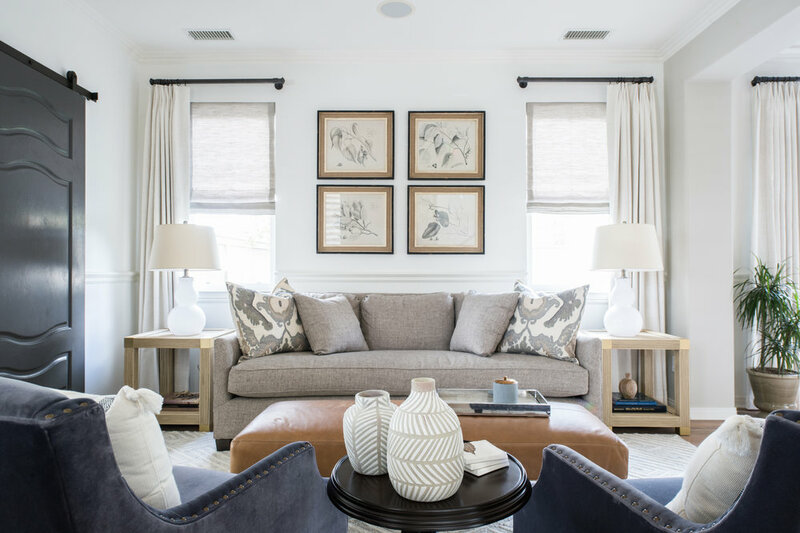 To balance the room we did a large single cushion warm gray sofa, two velvet charcoal chairs and a stunning cognac leather ottoman, all from our Bungalow 56 custom line. To keep the symmetry in the room we did two oversized side tables with large white table lamps. In the dining area we kept the dining table and end chairs but paired them with a tailored linen chair. Before there was too many wood elements competing with each other so we had the warm wood credenza painted a dark charcoal and also had the sliding barn doors painted in the same color. Having these two dark pieces compliment each other nicely and tie the two room together. Having patterned curtains in an open concept room can sometimes be overwhelming. We opted for a clean creamy linen curtain to elongate the walls and create the bright airy space our clients wanted. 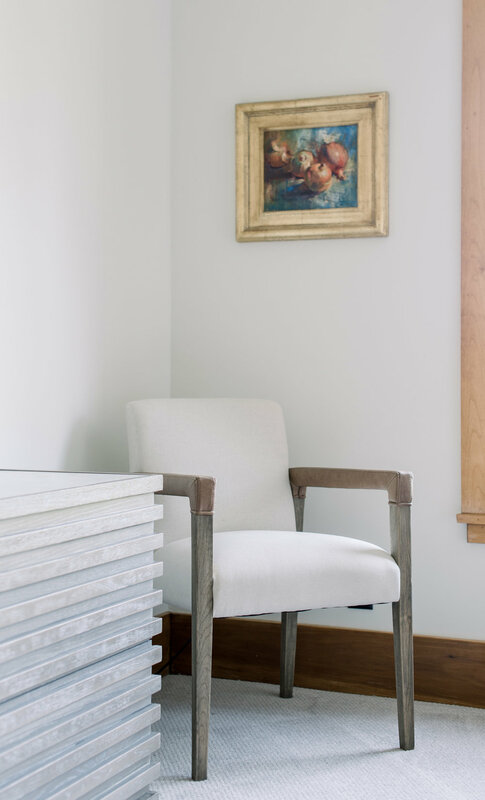 When accessorizing this room we kept things simple and just love how this space came together.